Anna Laine works at Dalarna University, Campus Falun, and its School of Education and Humanities since the Fall 2009. She is an anthropologist and a member of a research group focusing on Audiovisual Culture, within the framework of a new research profile area at the university entitled ”Kultur, identitet och gestaltning” (Culture, Identity & Interpretation). Anna Laine defended her doctoral dissertation entitled ”In Conversation with the Kolam Practice. Auspiciousness and Artistic Experiences among Women in Tamilnadu, South India” at the Division of Social Anthropology, School of Global Studies, University of Gothenburg, on Saturday 28 March 2009. The faculty opponent was Dr Amanda Ravetz from the Manchester Institute for Research and Innovation in Art and Design (MIRIAD) at Manchester Metropolitan University, UK. The thesis explores the kolam, a South Indian practice where women daily draw geometrical images in front of their homes to invite the deities. Through this practice, women engage in social and religious processes. They generate an auspicious atmosphere and become constructed as feminine beings. Temporal and spatial rhythms are defined and reproduced, and the house is made into a home. At the same time, the practice provides a space for exploration where kolam makers can experiment with changing circumstances and values. In her thesis, she investigated the kolam both as a performative process, and as a material result, and the ethnographic material is treated from anthropological perspectives on art and gender. To grasp the practice from a wider perspective, multi-sited fieldwork has been employed, among various castes and classes, both in rural and urban areas of Tamil Nadu. The aim is to contribute to anthropological understandings of and approaches to images, aesthetics and artistic practice. More information, with a link to the full-text thesis. 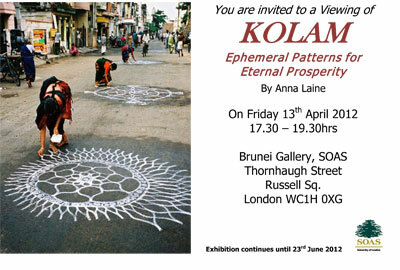 Besides the anthropological work, Anna Laine has also been engaged in an artistic project, a form of Visual Anthropology, which involves the Kolam tradition. Anna, as a photographer and film maker, has collaborated with a Kolam maker in Tamil Nadu, S. Malathi Selvam, as well as with the Swedish artist Kristina Matousch, based in Malmö but trained at the Royal University College of Fine Arts (KKH) in Stockholm, and Dr Alka Pande, Consultant Arts Advisor and Curator for the Visual Arts Gallery at India Habitat Centre in New Delhi. In August 2008, Ms. Laine was awarded a SASNET planning grant to organise a series of interdisciplinary workshops titled ”The Kolam Practice of South India – in Dialogue with Anthropology and Art Practice” with Dr. Pande and the other partners mentioned above. The aim of the workshops was to explore a new interdisciplinary approach. Instead of transgressing the border between natural sciences and the humanities/social sciences, this application concerns the border between sciences, in this case anthropology, and art practice. More information about the 2008 SASNET planning grants. During the period 13 November 2010 – 16 January 2011, the Museum of Ethnography in Stockholm presented an exhibition on Kolam, made by Anna Laine. The exhibition was entitled ”Kolam – flyktiga mönster för ändlös lycka”. Later, in September–October 2011, it was also on display at Kulturum, Kulturhuset Blå Stället in Angered, outside Gothenburg. During the period April–June 2012, the exhibition was also shown at the School of Oriental and African Studies (SOAS), University of London. In September 2011, Dr. Anna Laine was awarded SEK 2.2 m as a research grant from the Swedish Research Council for a three-year project (2012-14) within the field of Artistic Research. The project is entitled ”Reconfigurations of Identity in a Deterritorialized Setting: The Visuality of ´Tamilness´ in Diasporic Sites on the Web and in Neighbourhoods of London”. Project abstract: The aim of this project is to explore the role of visual appearance in the construction and performance of cultural identity. The study will enhance the knowledge on how social, political, religious and aesthetic issues interact in reconstituting visual aspects of identity among ethnic minorities. It is positioned in the overlap between art and anthropology, based on recent interests among artists in ethnographic methods and collections, among anthropologists in phenomenology and multisensorial forms of expression, and in the joint interest in politics of representation. The project will contribute to investigations of how new practices that draw on both disciplines can be developed to improve understandings of cultural differences and similarities, situated in everyday lives and local moralities. The specific concern is how norms and practices in the Tamil homelands of South India and Sri Lanka are reconfigured in relation to new circumstances and values in diasporic deterritorialized sites. Ethnographic fieldwork will be conducted in sites physically grounded in London and virtually constructed on the web. The project is a development of Anna Laine’s PhD on visuality among Tamils in South India. 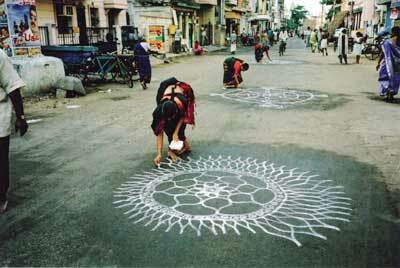 It has the same artistic practice, the kolam, as its base. With personal experiences of both artistic and anthropological practice, the aim is to expand the overlapping space between traditional boundaries that separate theoretical and practical knowledge. Anna Laine is also member of another research project at the Museum of Ethnography in Stockholm. The project was entitled ”Sacred Matters” and has been carried out in collaboration with the Museum of World Cultures with funding by the Swedish Arts Council. As an outcome of her research project funded by the Swedish Research Council, and based on eighteen months of ethnographic fieldwork in London, Belfast, and Jaffna, Anna Laine recently published an article entitled ”Migration Research in Collaboration with Tamil Sri Lankan Artists in the British Diaspora” in the Open Access and peer-reviewed Journal for Artistic Research (JAR). In the article, published in the 8/2015 issue of JAR, she has investigated how artistic practice is used among British Tamil artists with a Sri Lankan background to explore their multiple belongings and in-between notions of homing and migrating. Through the author’s position in the overlap between art practice and anthropology, the exposition poses questions about the possibilities of an interdisciplinary approach to artistic research. The additional overlap with the Tamil artists’ profession challenged the relationship between self and other in the research process, and knowledge has consequently been produced in a collaborative form. Go for the JAR article.